So summery and mouthwatering! This is a beautiful salad. Ooh, I love the sound of peaches with feta. Lovely! Magnificent, Lisa! This salad IS summer! If only madelines didn't terrify me! A very beautiful summer salad, Lisa. Lovely salad! So fresh and delicious! I love salads like this and it looks totally gorgeous Lisa! 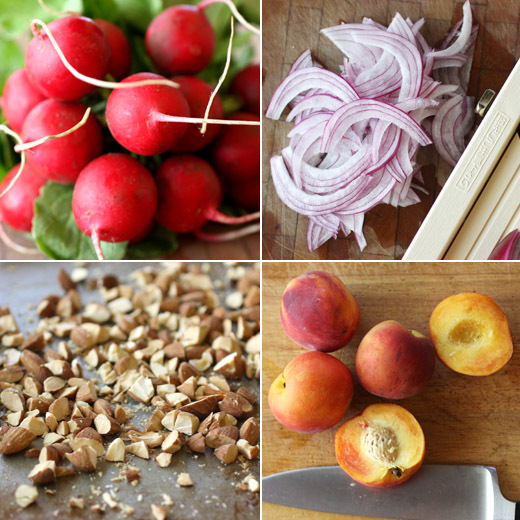 I'm not normally a fan of radishes, but this recipe might be enough to change my mind. It looks awesome! I love the idea of broccoli hushpuppies! And because I really enjoy radishes, I'm a fan of this salad as well. 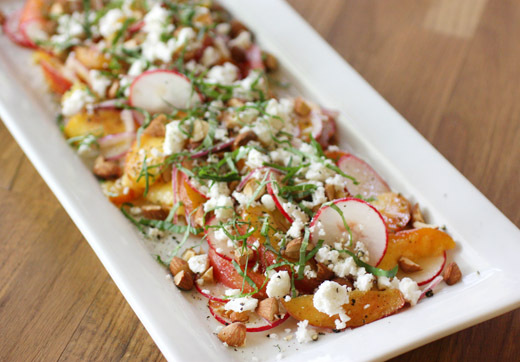 I've never combined radishes and peach before - I don't know why not - but this looks wonderful. I gotta try this - thanks so much. a milder feta sounds terrific--i'll definitely be looking into that! this is a magnificent combination of tastes and textures. Pretty salad! 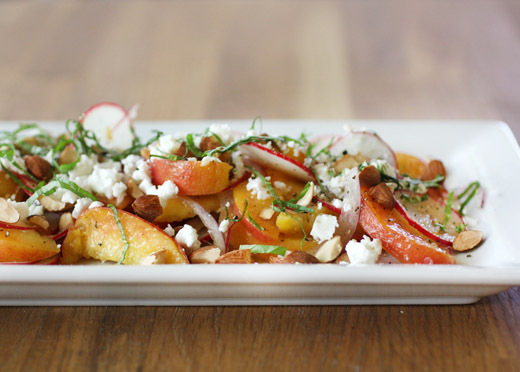 I love the idea of pairing sweet peaches with peppery radishes and tangy feta. Sounds like a tasty summer treat. Lisa, that is a plate of summer loveliness! I cannot stop gorging on peaches these days and I seem to want to add spicy radish to every salad - but never have I put the two together. Totally inspired! And the book sounds great. I love those little tips about seasonal goodies. Putting scraps to good use makes me happy. Oh my word, this is so creative!! I'd love to try it out myself! That book sounds like one I really need to add to my bookshelf, Lisa!!! And that salad, what an amazing array of flavors and colors. I do believe I wouldn't mind jumping right in!!! Just so refreshing looking at your salad. Though I can't taste it, I know it is very flavorful with all the fresh ingredients. I've recently become a lover of radishes so I'm always looking for new ideas for them. This sounds amazing. Such beautiful photos! Wow! Super combination of flavors. I gotta get that book. Thanks for the note on French feta. Haven't seen it in the grocery stores, but we have a few great cheese markets that probably sell it. To be honest, we always use Greek feta or any feta from our Mediterranean or Middle Eastern markets. It's good to know the difference!